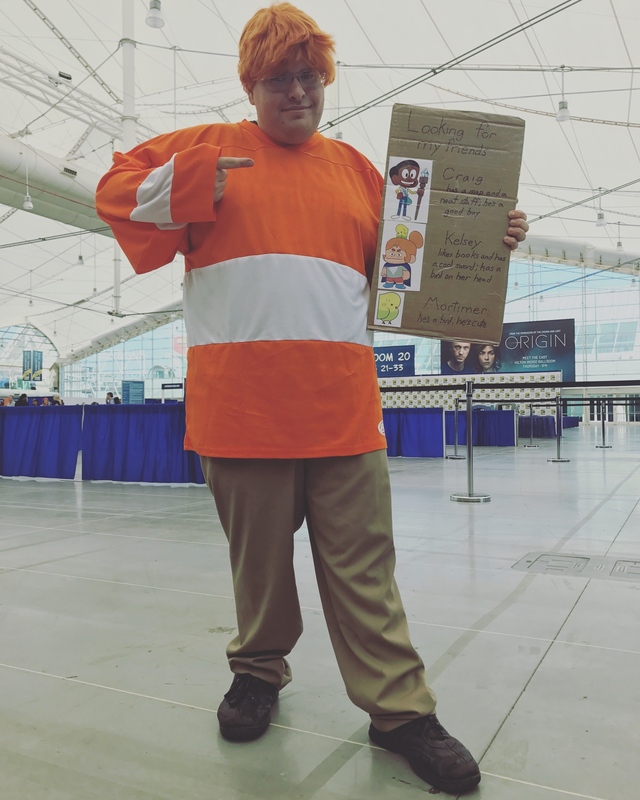 Not many people recongized me as JP, but it still was pretty awesome to be one of the first cosplayers for JP for Craig Of The Creek. Needless to say, Preview Night was going to draw a huge crowd for people. Above is a photo of the waiting area, the Sails Pavilion, where everyone waits for the Exhibit Hall to open up at 6 PM. My friends and I got in line around 2 PM. We were not taking any chances. 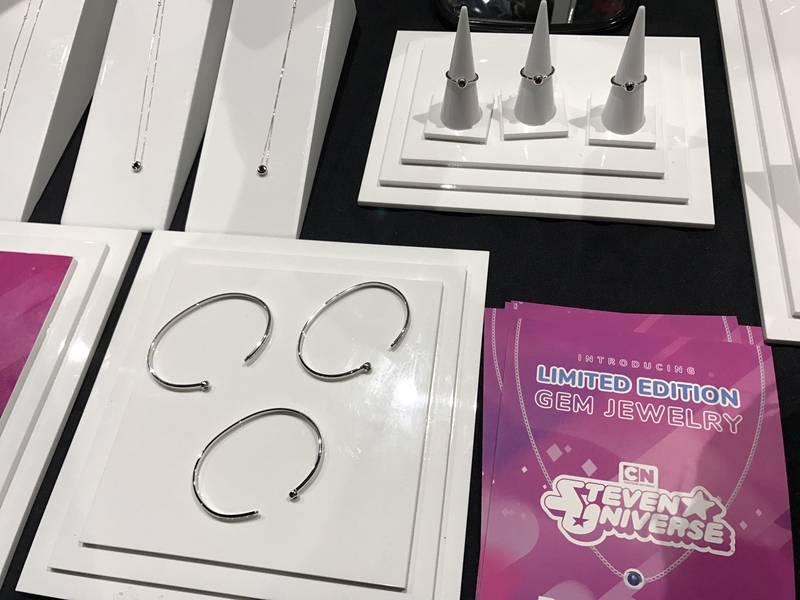 In the Exhibit Hall, Cartoon Network pulled out all the stops. 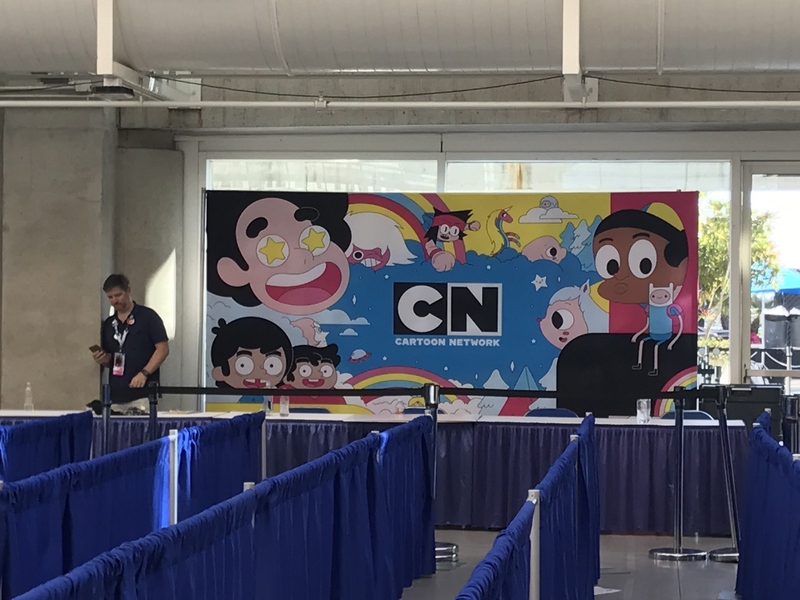 I'll be honest, over the last few years, CN has been "meh" with their booths. That was, until last year when they recreated Gar's Bodega from OK K.O.! : Let's Be Heroes!. After they did that, I honestly did not thing they could do better than that. Obviously, I was mistaken. 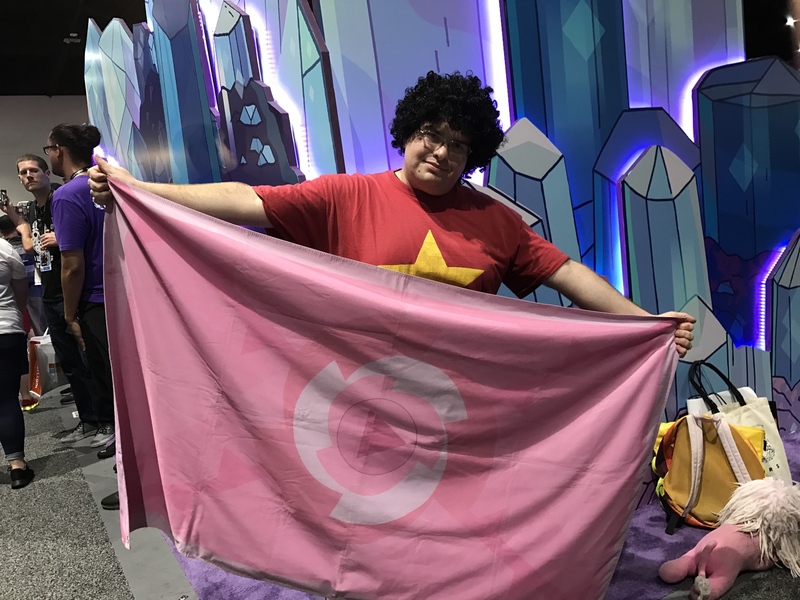 This year for the booth, Not only did Cartoon Network give us giant, inflatable Crystal Gems along with Steven Universe pins, but there was also a photo op where you could pose with some Steven Universe props! One of the photos I had taken at the Cartoon Network booth with my friend Marianne. 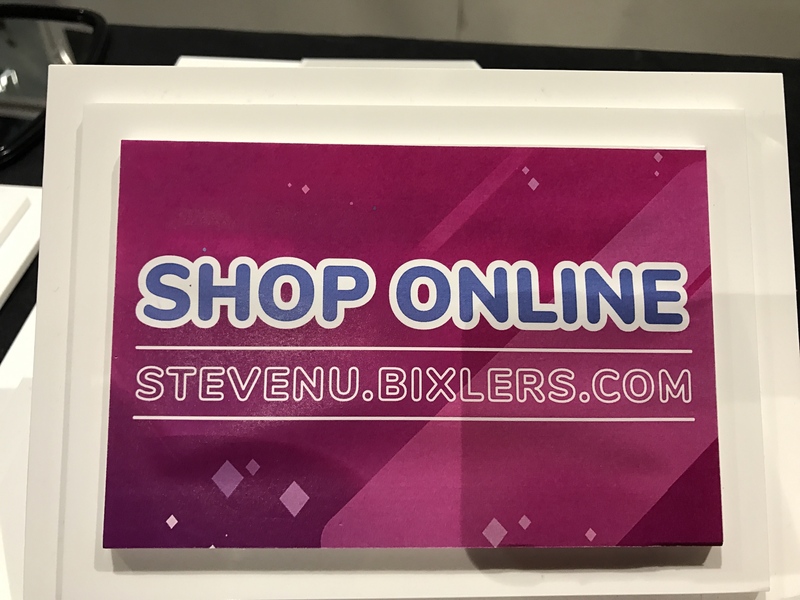 After the photo, they would give the participants a Steven Universe tote bag (rumored to be limited to 500 per day). 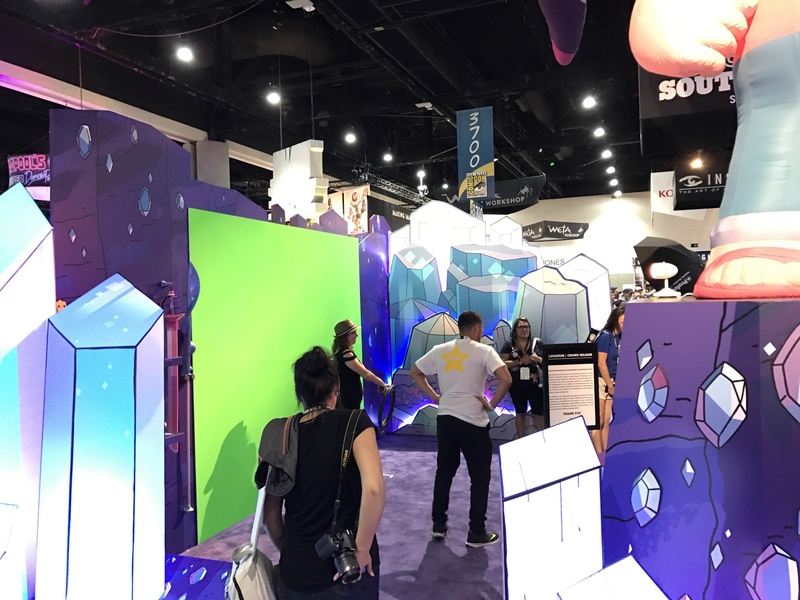 Cartoon Network certainly went above and beyond with their booth this year. 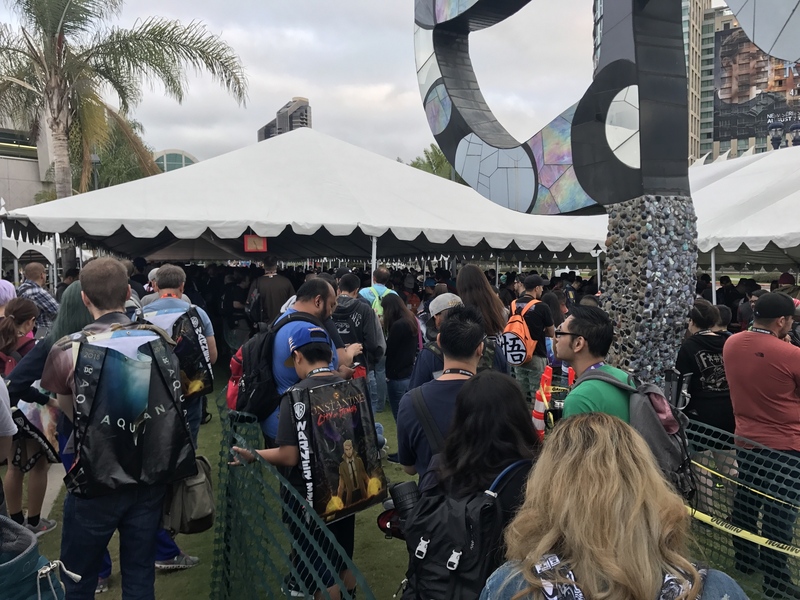 This line here was the morning line into the Exhibit Hall. It was packed. If it was not for the fact that we were inside with the air conditioning on at full blast, I'm positive the heat would have been crazy. Anyway, I took advantage of the day to explore the floor. This is why you don't have the general public work together to do something. 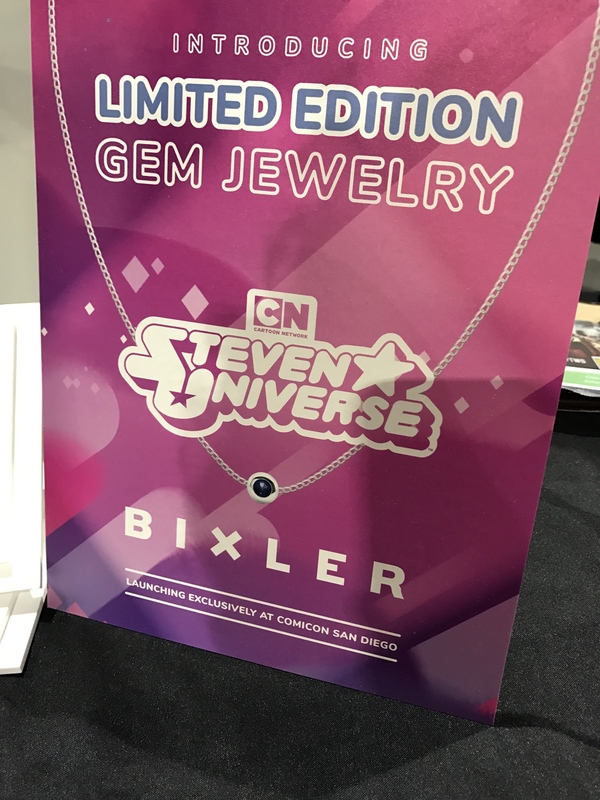 While wandering around, I found out at the Dark Horse booth that we will be getting at Steven Universe coloring book in the future. If the above example of what will be in the book, it will be along the lines of the adult coloring books that have been pretty popular as of late. 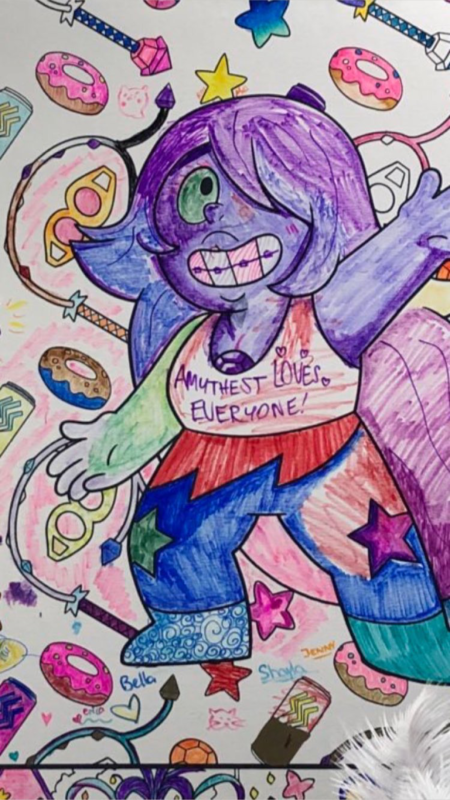 Also, my friend went back later that day and showed me that this was the final product of Amethyst. Seems very Amethyst. Not far from the Dark Horse booth was the Viz Media booth, and they were going just as crazy with their stuff. 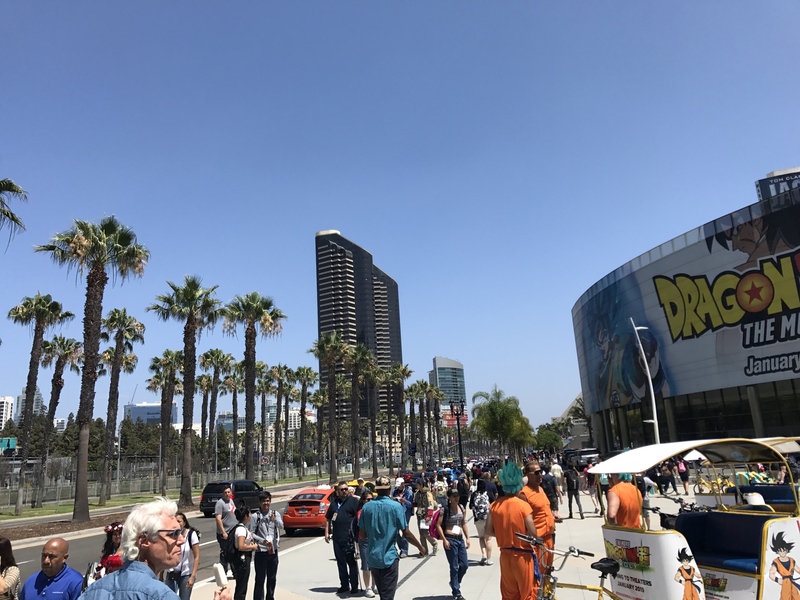 The creator of the manga My Hero Academia, Kōhei Horikoshi, was scheduled to appear at San Diego Comic-Con (his first American appearance at that). Viz was continuously packed with fans. 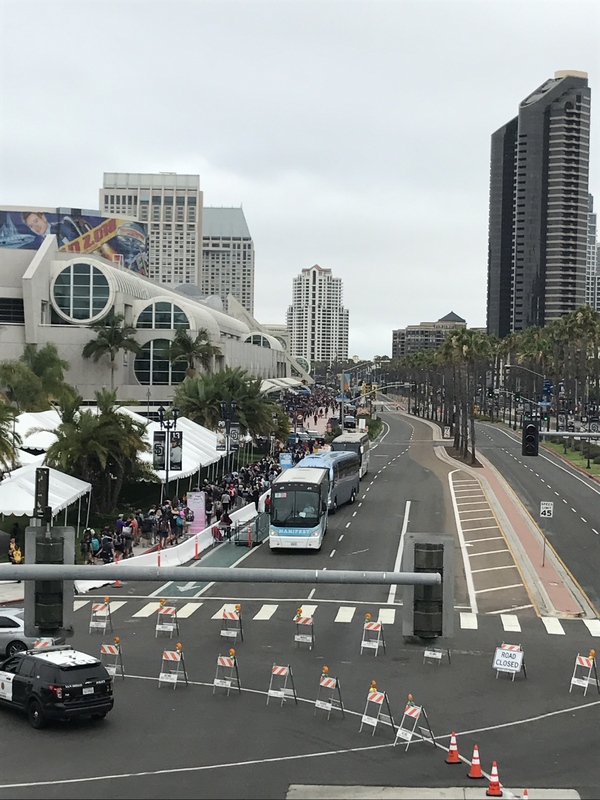 From what I heard, on Saturday and Sunday, when Horikoshi was there to do signings, the booth caused such bad traffic jams in the walkways that the fire marshalls almost had to close the whole Viz Media booth. 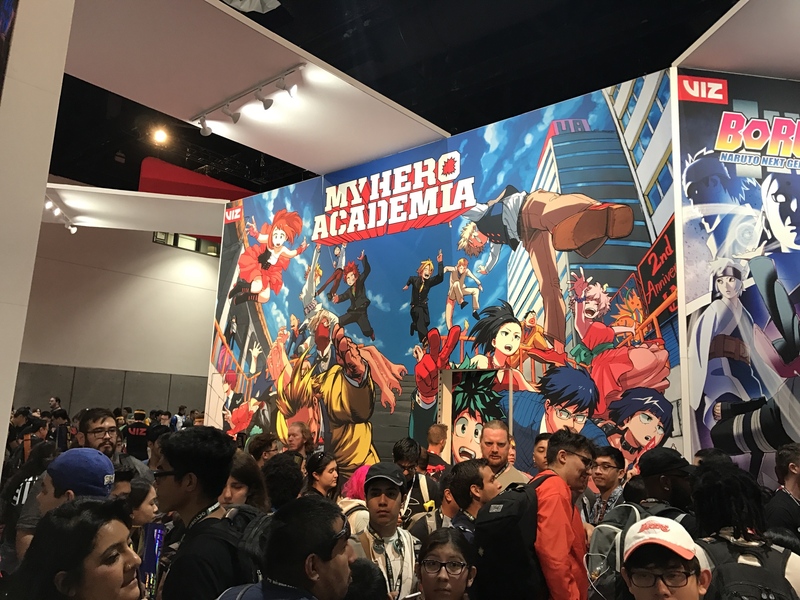 I'll be the first to admit that while I love My Hero Academia, something needed to be done to improve the traffic around the booth. 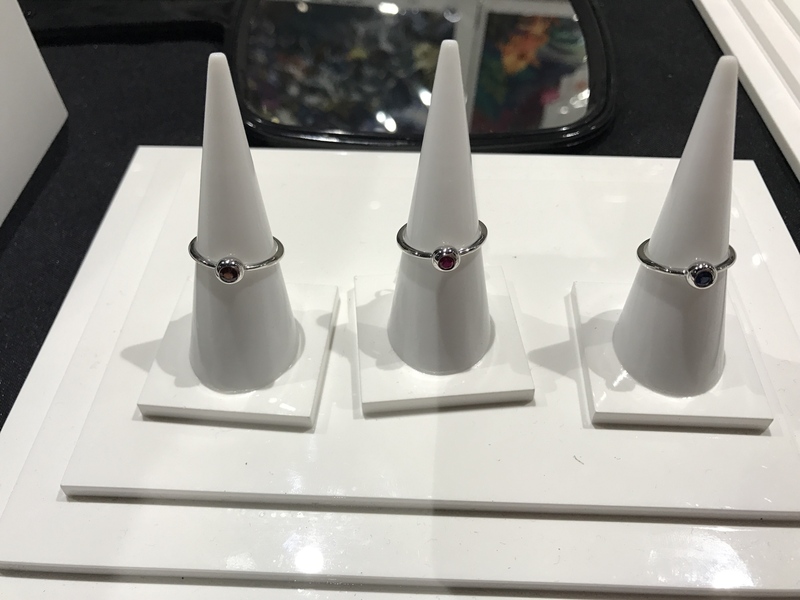 Anyway, I was exploring the con while I could. 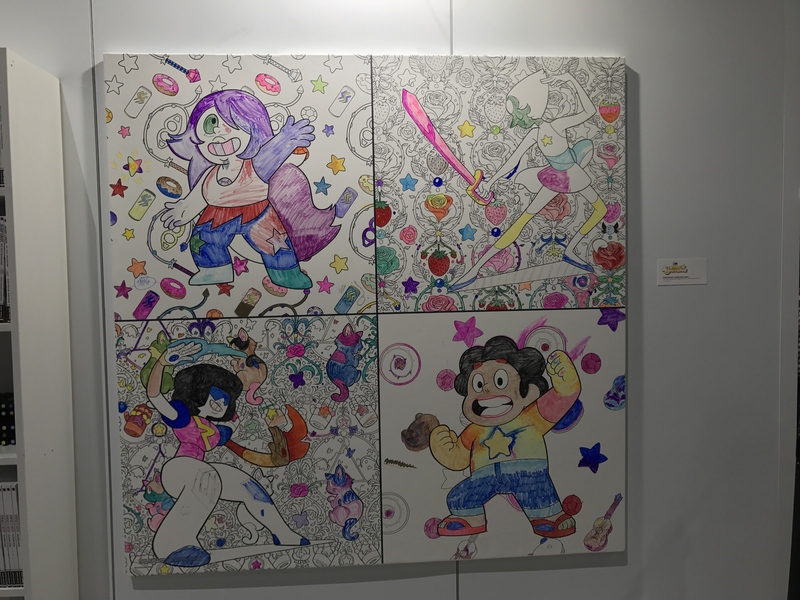 Since I couldn't attend the 'Superheroes of Body Positivity: A Conversation With Steven Universe's Rebecca Sugar and Friends' (it was offsite at the Horton Grand Theatre, and I was unable to get tickets in time, unlike a few friends), I continued to wander around. One of my friends and I explored outside for a bit and enjoyed the atmosphere. This is not an easy cosplay to do when it comes to heat. 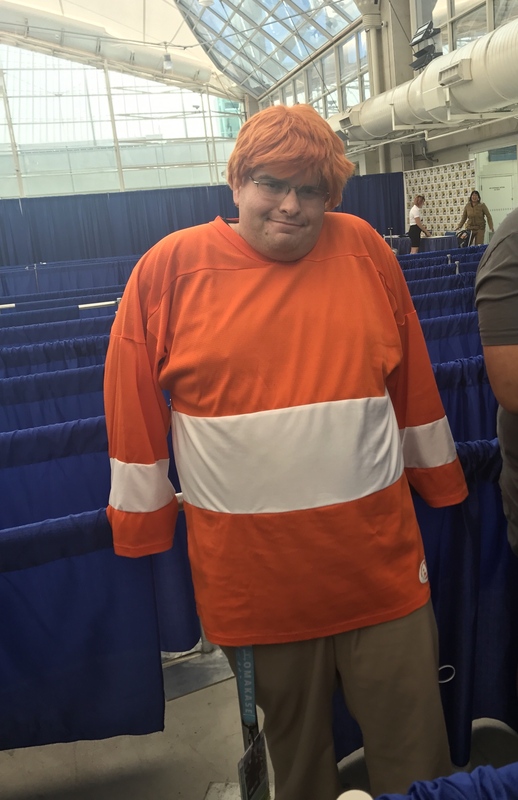 Apparently, my Porco Rosso cosplay turned a lot of heads and surprised a lot of people. I will admit that due to this cosplay and a few other factors, my buddy and I headed back to the hotel early that day. Friday was even more crazy for the convention. 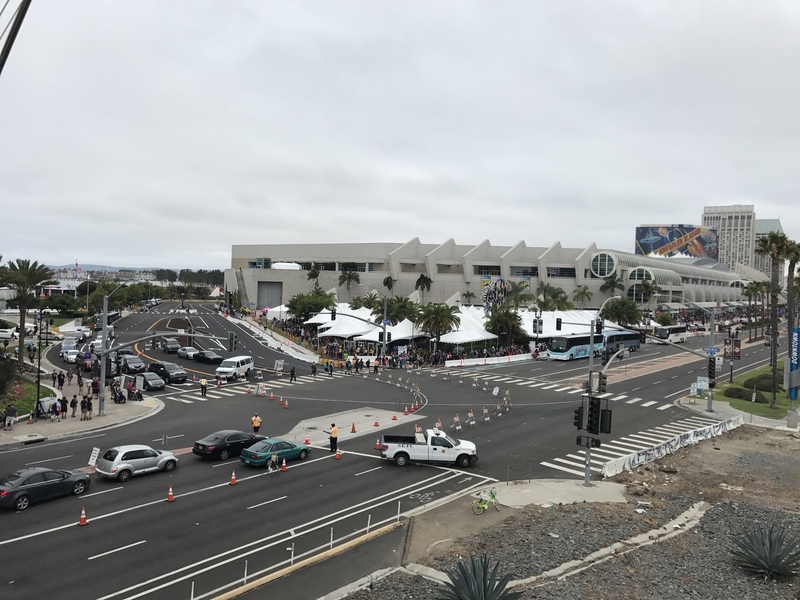 One major improve me that SDCC has done this year was closing down Harbor Drive to regular traffic. 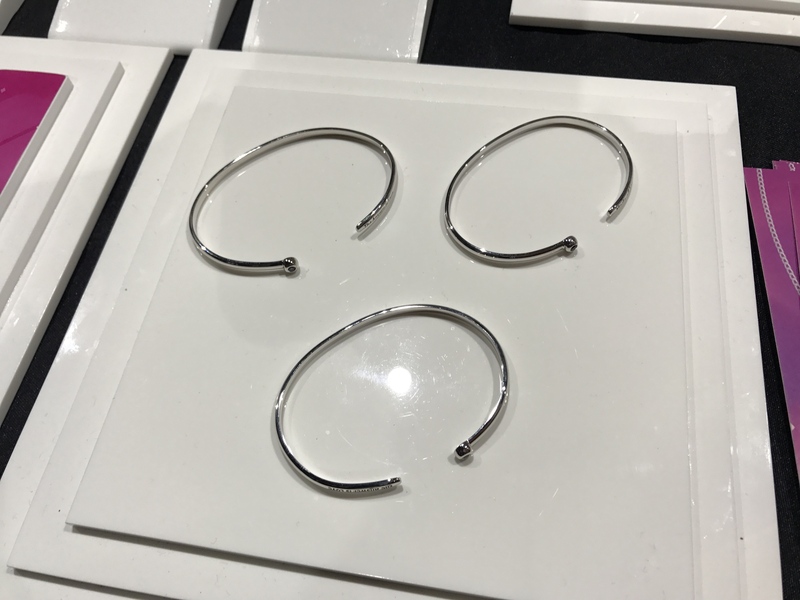 This meant that only badge holders would be allowed near the con center, and making things much nicer for attendees. 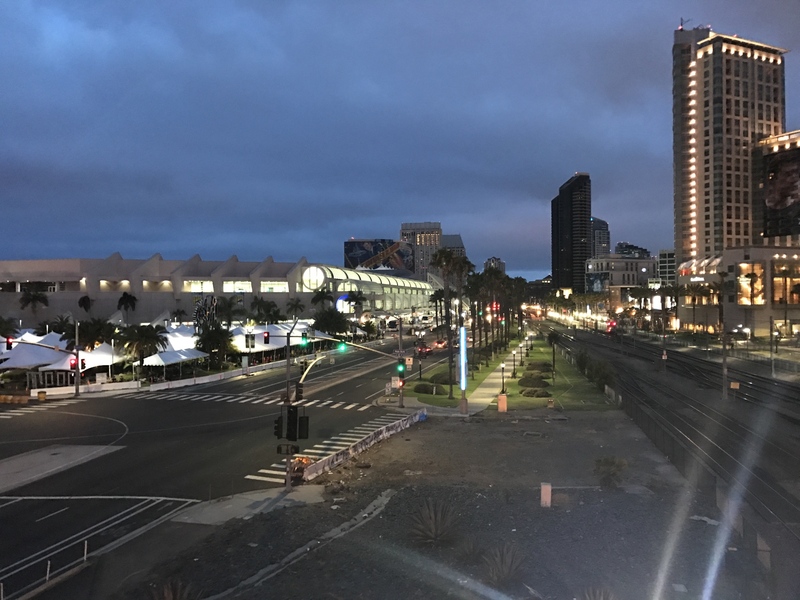 Of course, as the above photo shows, traffic could still be a bit tricky in the morning before the con center opens. 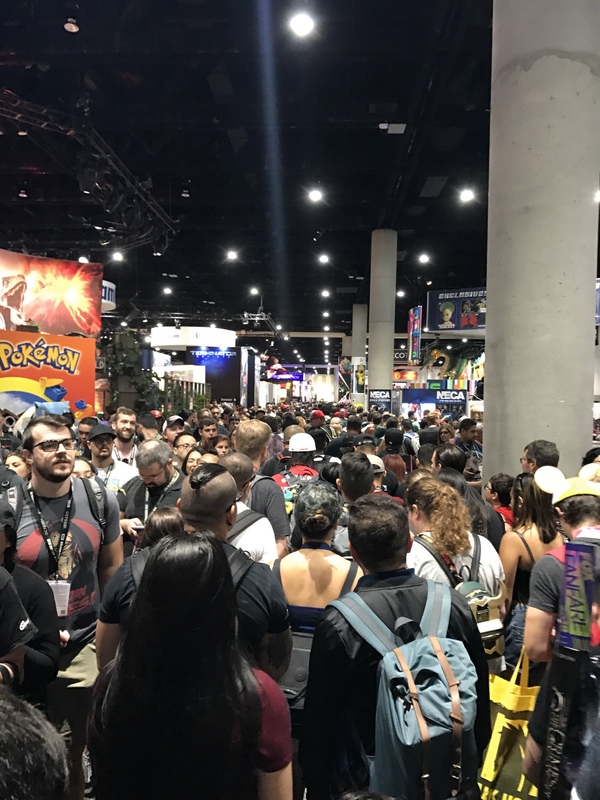 Just like it was the day before, the con was packed. It never ceases to amazing how busy this con gets. And, it never ceases to amaze me how many cosplayers show up. I always love seeing OK K.O.! cosplayers. Including cosplayers of all ages. Sketchbook with the ticket to the Rebecca Sugar signing. 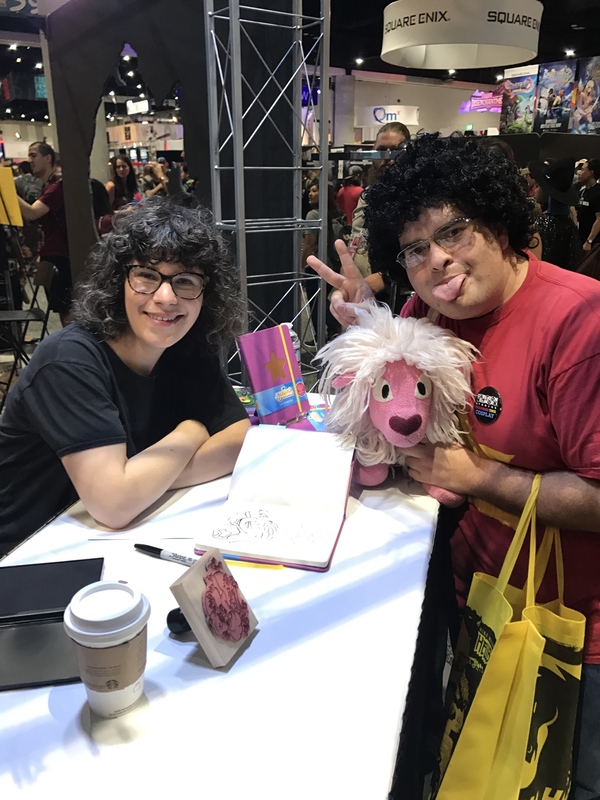 On Friday, there was a signing for the magnificent Rebecca Sugar. This was for a signing for the release of the new sketchbook that will be released (apparently September according to the folks at the Insight Editions booth). The tickets were limited to 100, and if it were not for someone giving up their spot (for whatever reason I cannot even begin to fathom), I would not have gotten into the signing. 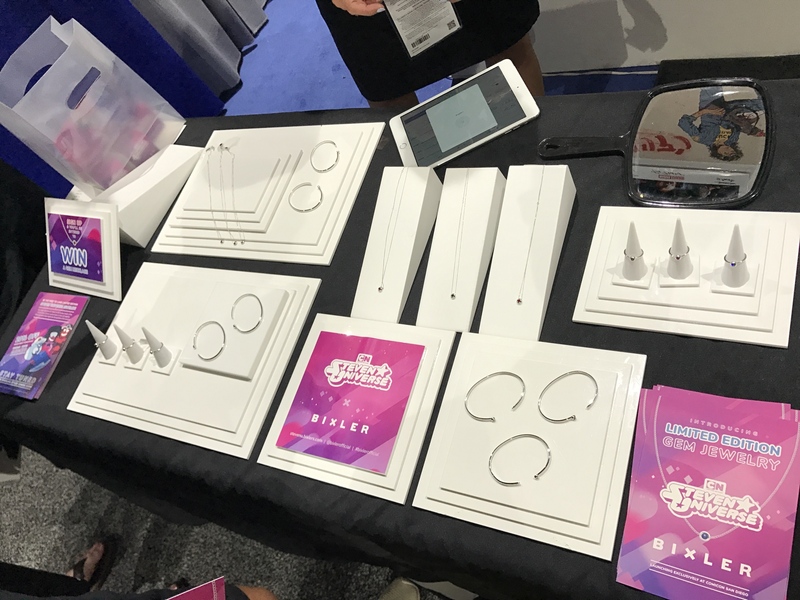 Rebecca Sugar (left) and Little Ursa (right) at the Insight Editions booth at San Diego Comic-Con 2018. It still blows my mind that she remembers me every time I run into her. She's just an absolute angel and just such a sweetheart. As usual, she asked for any requests for sketches. I felt like giving her a curve ball, so I said Bismuth. Rebecca seemed overjoyed about drawing Bismuth and mused that one thing she likes drawing with Bismuth is her underbite. She then talked about how Bismuth's voice actor, Uzo Aduba, taught her a lot about musical theatre. She also added that they would often talk at length about the musical Wicked. 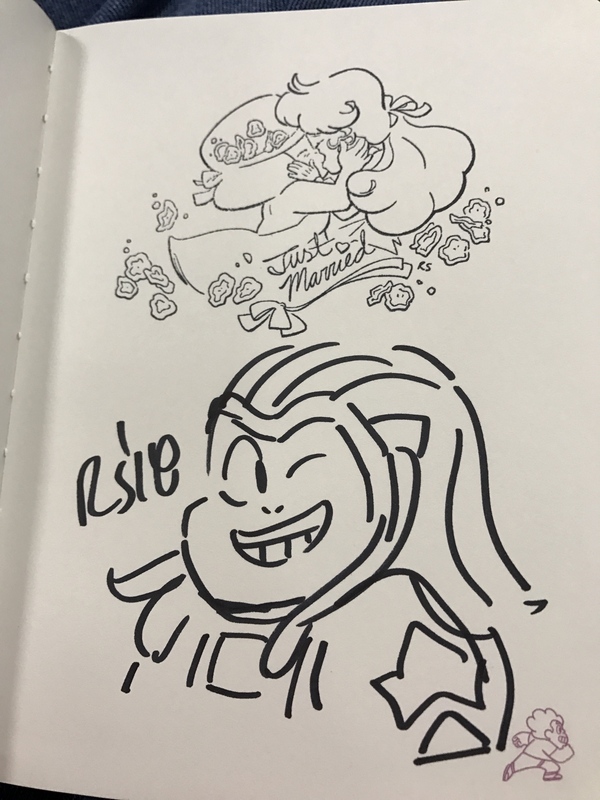 Ruby and Sapphire wedding stamp and Bismuth sketch, both by Rebecca Sugar. 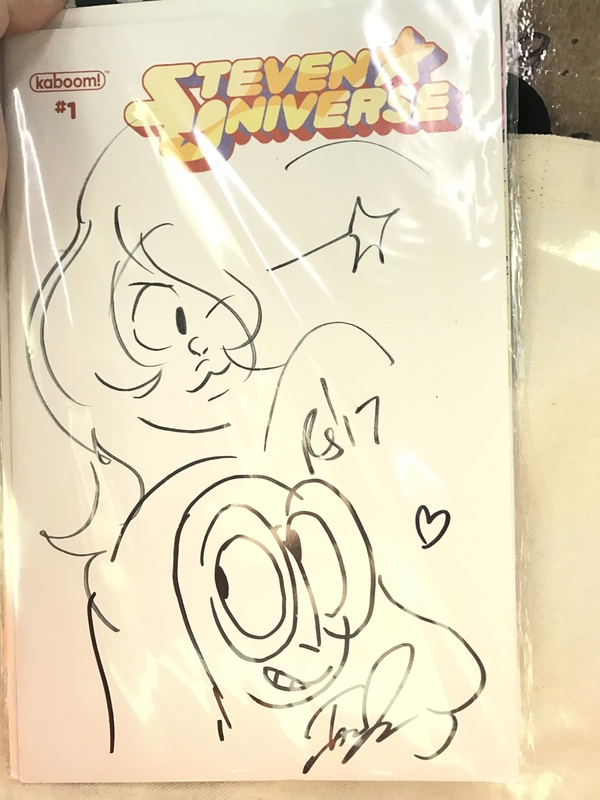 Since I know you all want to see what Rebecca Sugar drew for me, here it is! 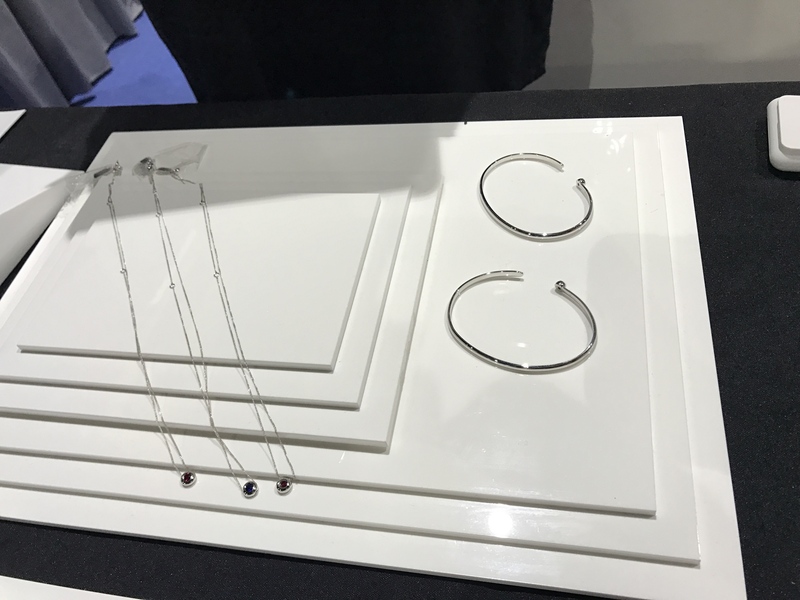 Another major announcement for Steven Universe things at SDCC was the launching of a Steven Universe jewelry line! 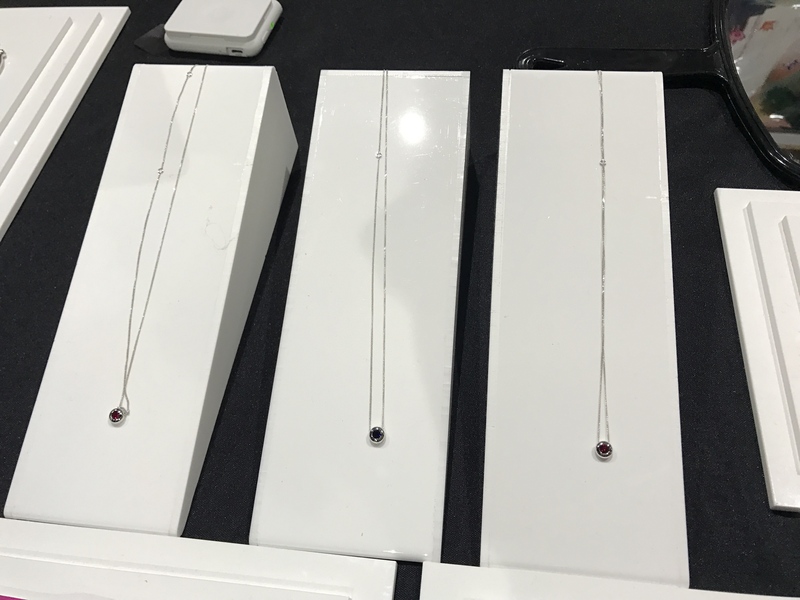 Bixler showed off the the start of the gem jewelry line, focusing on Ruby, Sapphire, and Garnet, with more planned in the future. 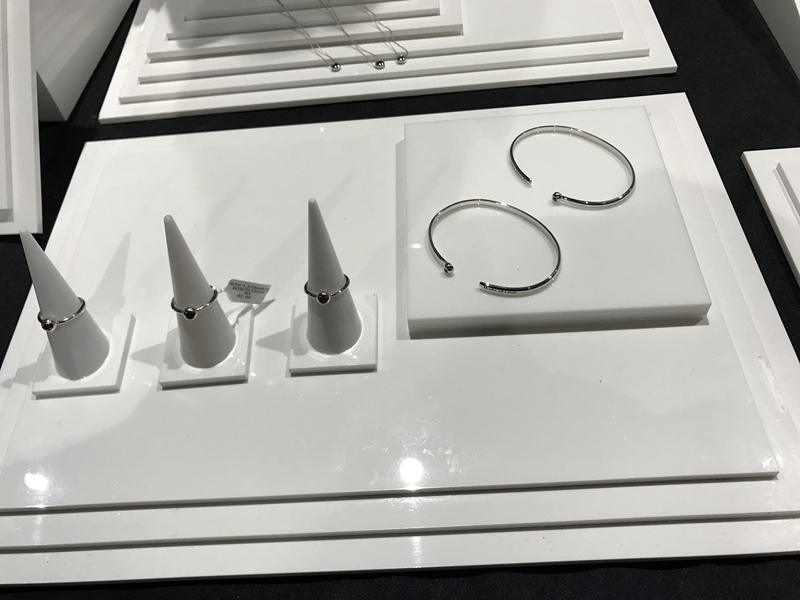 Below are images of the jewelry that they had on display. 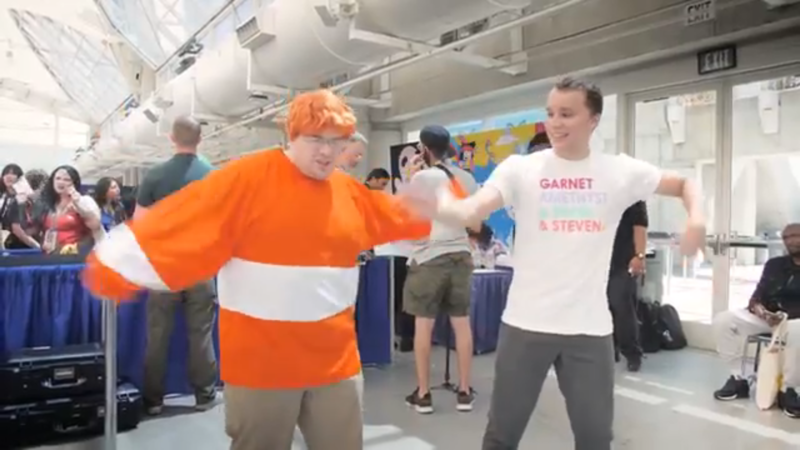 And, of course, since I was cosplaying as Steven that day, Cartoon Network had to take some photos of me! 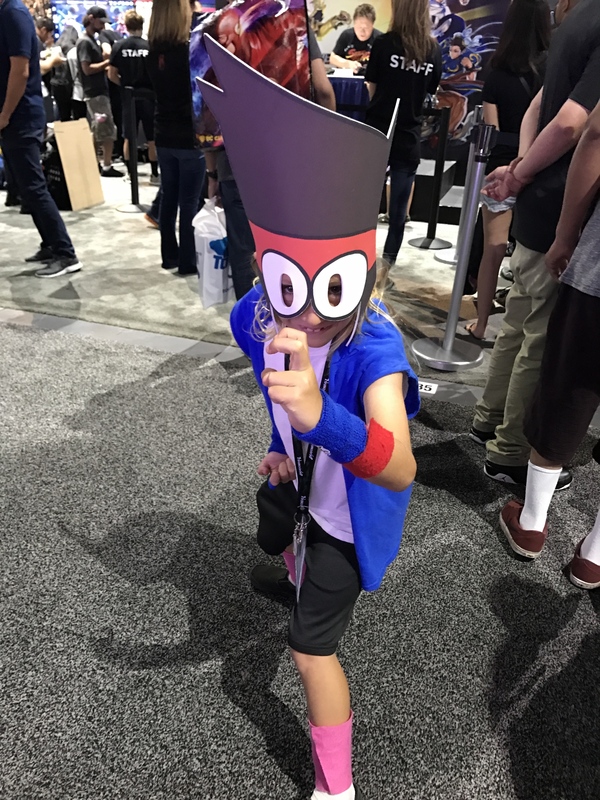 Almost every year they insist on getting photos of me dressed up as Steven or any other Cartoon Network character I do! 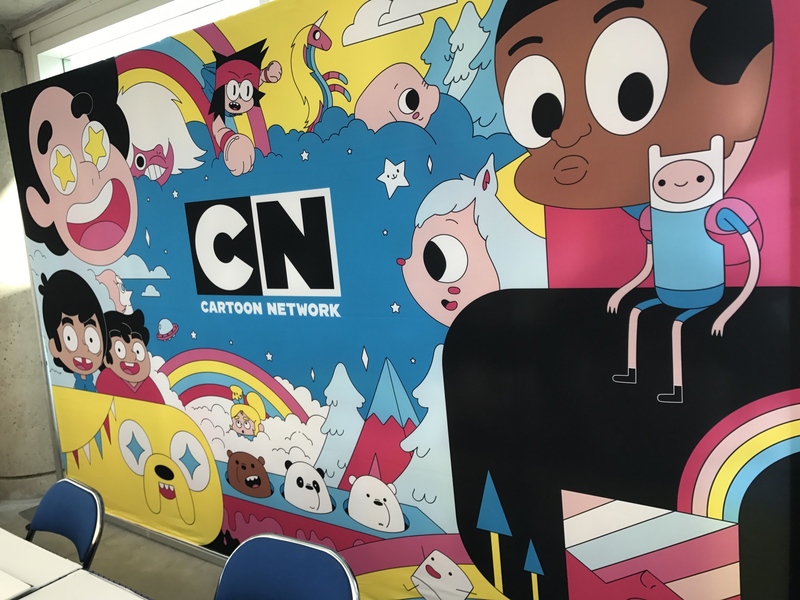 The above photo is of the special backdrop that Cartoon Network had brought for the autograph area. 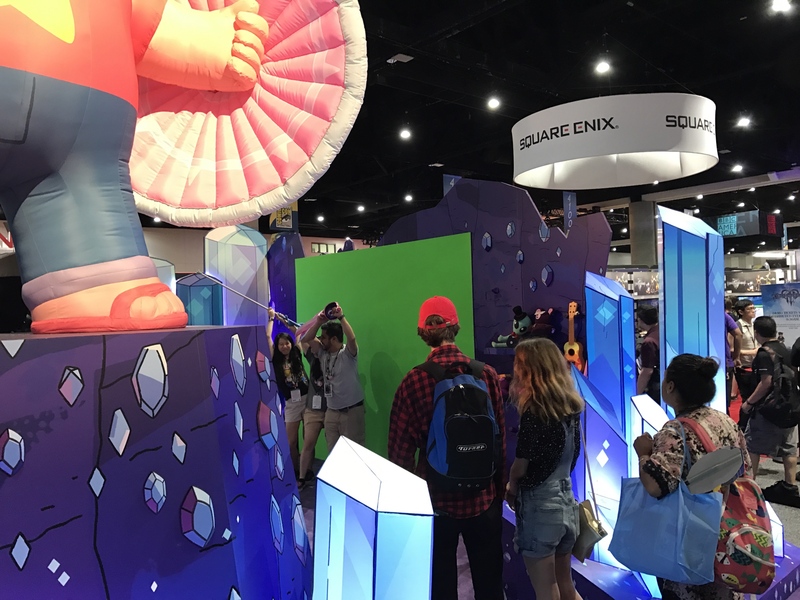 As you can see, we get a huge Steven with Amethyst and Pearl up in the top left corner. Some of the Cartoon Network folks saw me taking the picture and they insisted that I could go up and get a better picture. Up close, we can get a better view of everyone! 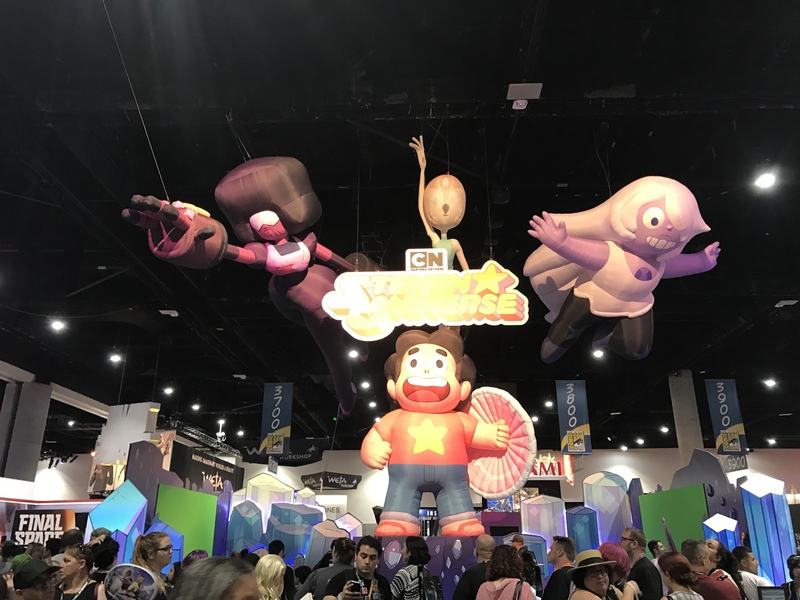 We see that tons of Cartoon Network shows are featured, including OK K.O.! : Let's Be Heroes!, Adventure Time, Summer Camp Island, We Bare Bears, Craig Of The Creek, and the upcoming cartoon Victor and Valentino. 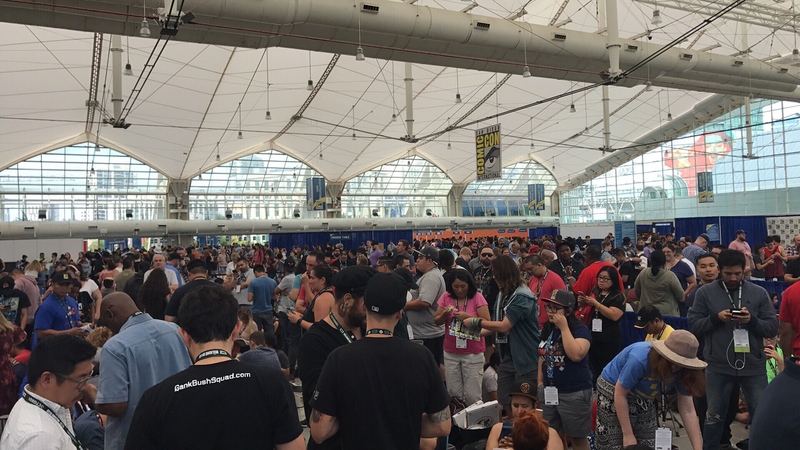 The next day, Saturday, was the biggest day of Comic-Con. 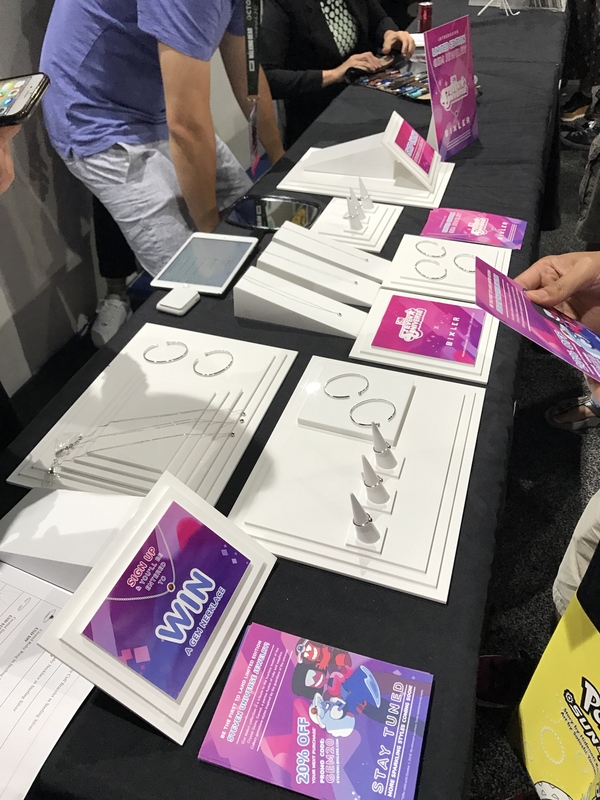 Sure, there was the Steven Universe panel, but there was also the autograph signing, the Cartoon Network Creators panel and the signing for that. Since I wasn't one to take any chances with those autographs, I got to the convention center at 5 AM, as the photo can attest to. I was far from the only one who lined up early for the con. In fact, if I were to make a guess about my placement, I would say I was about 800th in line, if even that close. By the time I got inside to the autograph line, we were already outside. In fact, that's why a lot of the cosplay photos I took were at a stairwell, as I was seated on the stairs in line for about another two hours before the ticket drawing. 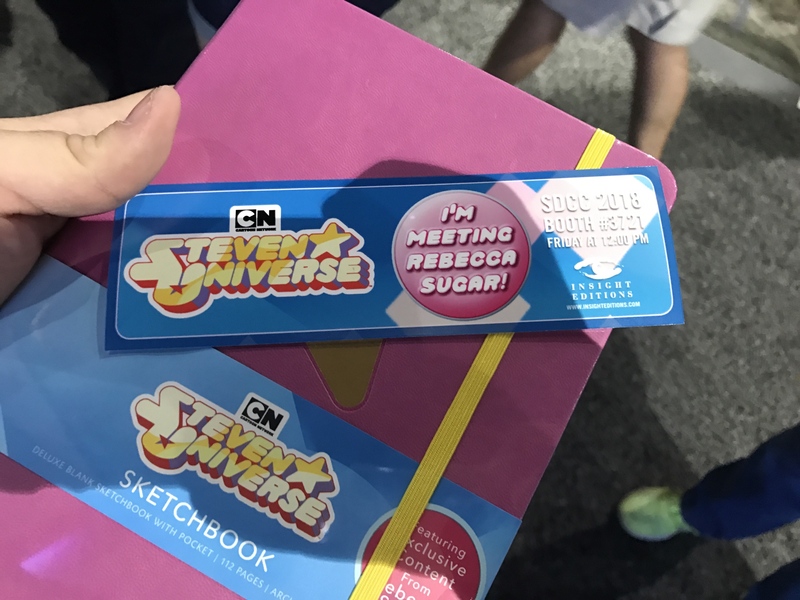 Unlike a lot of folks in line, I was lucky to not only get into the ticketed Steven Universe signing, but also the ticketed Cartoon Network Creators signing. And cosplaying as JP, I figured I had to do what I can to go to both signings! 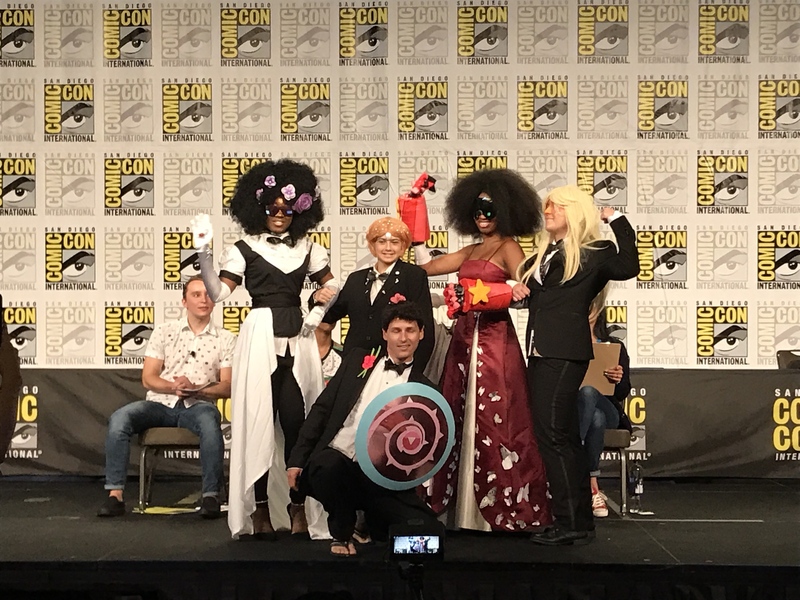 Behind the table, left to right: Zach Callison, Michaela Dietz, Shellby Rabara, Deedee Magno Hall, Estelle, and Rebecca Sugar. 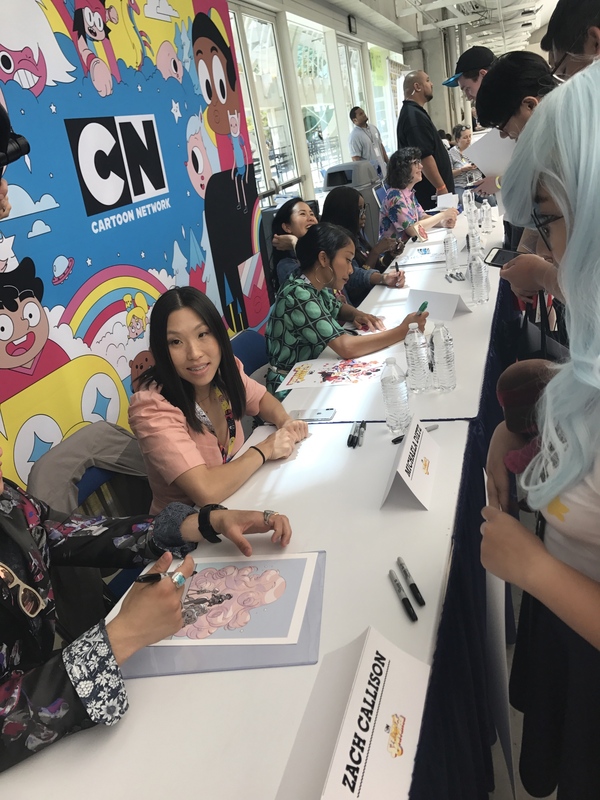 The signing was attended by the core cast (Zach Callison, Estelle, Michaela Dietz, and Deedee Magno Hall), the voice of Peridot who moderated the panel (Shelby Rabara), and creator Rebecca Sugar. It kinda blew my mind that each and everyone of them remembers me. Yes, I know I go to the signing every year, I've interviewed them, and so much more, but it still just shocks me, ya know? I won't lie: it's not the celebrities or the fact they are signing is why I want to go to the autograph signing each year, but rather it's the beautiful prints that they have each and every year. I mean look at it! Connie has her bobcut and she's playing the violin! She's such a cutie! And everyone looks like they're having so much fun! Left to Right: Ian Jones-Quartey (OK K.O.! : Let's Be Heroes). 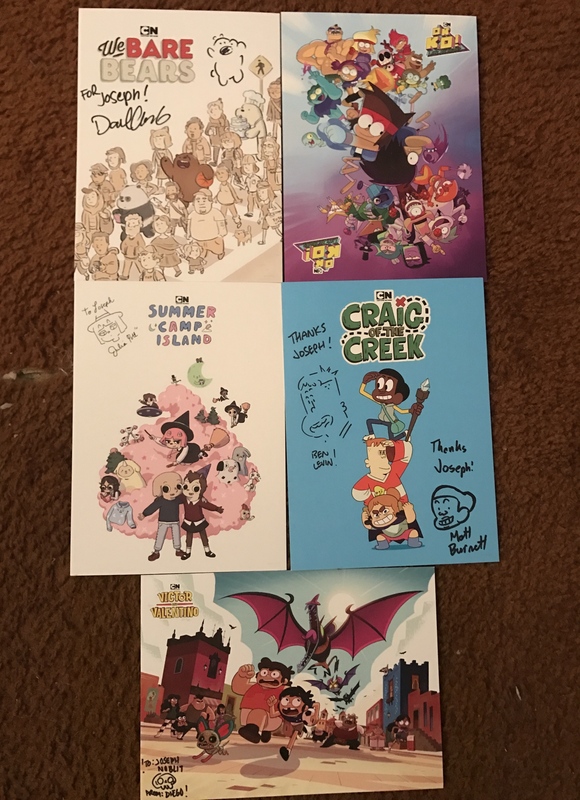 Daniel Chong (We Bare Bears), Matt Burnett and Ben Levin (Craig Of The Creek), Julia Pott (Summer Camp Island), and Diego Molano (Victor and Valentino). 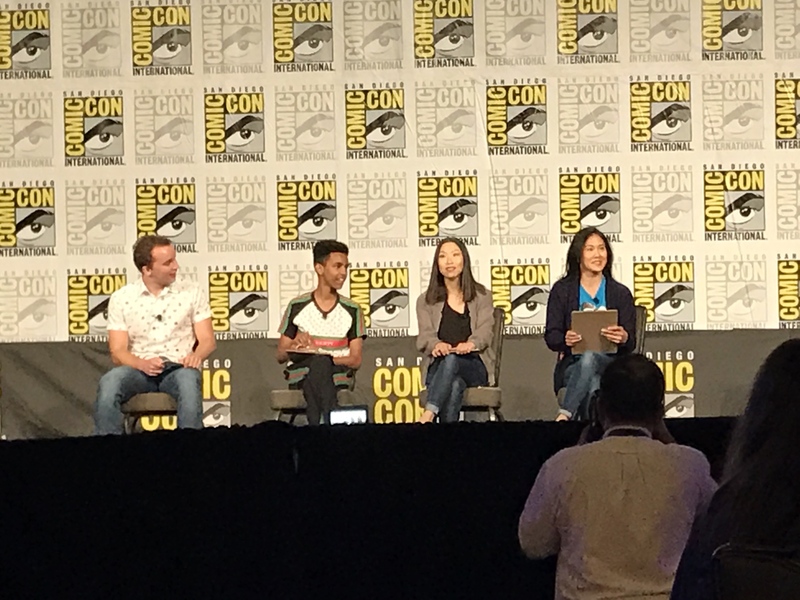 After the Steven Universe signing, I rushed to the panel I was looking forward to the most: Cartoon Network Creators - Drawing On Inspiration. This panel would not only be hosted by co-creator of Steven Universe and creator of OK K.O.! 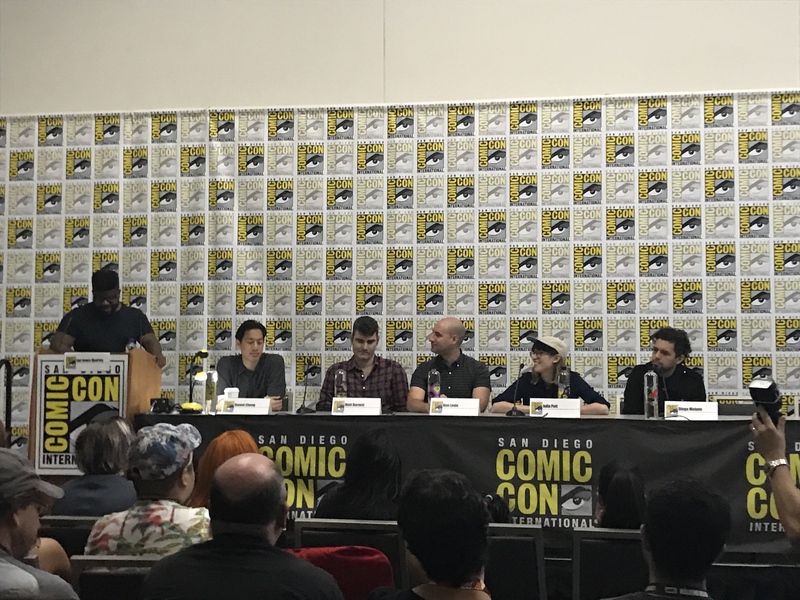 : Let's Be Heroes!, Ian Jones-Quartey, but also has a number of other talented creators: Daniel Chong (We Bare Bears), Matt Burnett and Ben Levin (Craig Of The Creek), Julia Pott (Summer Camp Island), and Diego Molano (Victor and Valentino). 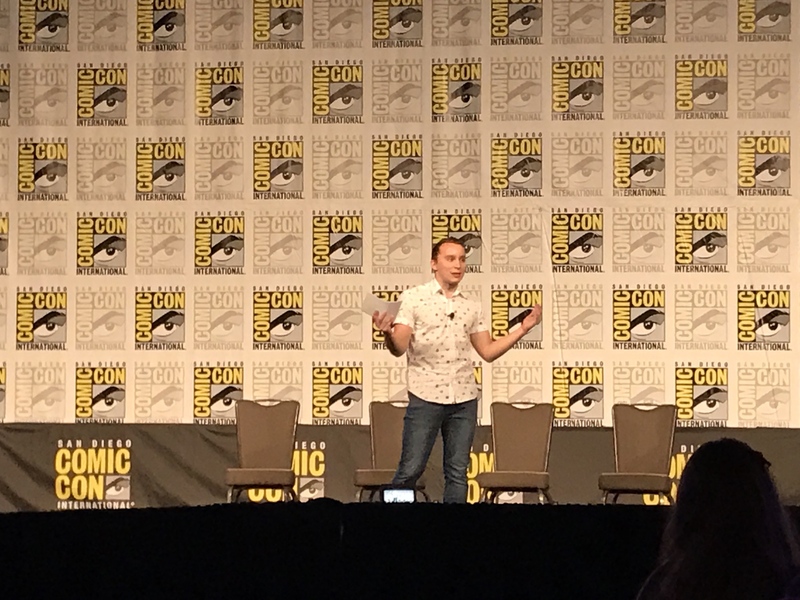 It was a really cool panel and I was able to ask a question in relation to what personal touches they put into their shows (the universal answer was music). Also, Matt and Ben loved my JP cosplay! In fact, Cartoon Network had some fun with me and asked if they could record me "doing the JP"! Little Ursa (left) as JP with Sam from Cartoon Network This Week (right) dancing to "Do The JP". Here's a picture of me "doing the JP" with Sam from Cartoon Network This Week! You can see me doing the dance with Sam in this video around 5:20! I absolutely love all the prints I got from that signing, especially since I finally got to talk to Julia Potts about how much I love her show, and with Diego about the other characters on his print (which he stated he can't talk about just yet, which makes me even more excited for the show!). Along with the cool prints that they had for each of the new shows, I got something a little personal signed by Ian Jones-Quartey. I brought my sketch comic cover that I had Rebecca sign last year. He seemed surprised that I brought it just in case I did get a ticket. I felt a little bad that I didn't have him draw me Dendy (because Dendy is totally the greatest character in OK K.O.! : Let's Be Heroes! ), he didn't have a problem drawing my second favorite character in Steven Universe, Connie! That night, I had to drive up to Los Angeles to take my friend home for an emergency, so I had to leave the con right after that. Apparently there were some really neat events including a uncut screening of Deadpool 2, the Japanese rock band The Pillows doing a surprise show for Adult Swim, and of course the Masquerade. But each con is different and has stuff like that happening, and it's all part of the experience. Sunday is usually the most relaxing and chill day of the con. Most people are still tired from the late nights and the long days of the convention. But that doesn't mean the events slow down! 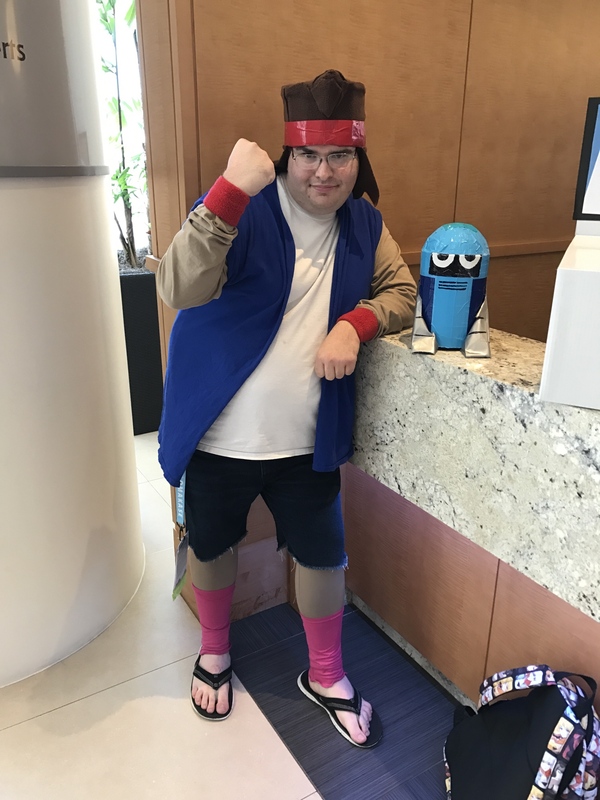 I broke out my KO cosplay for the Cartoon Network Costume Ball. 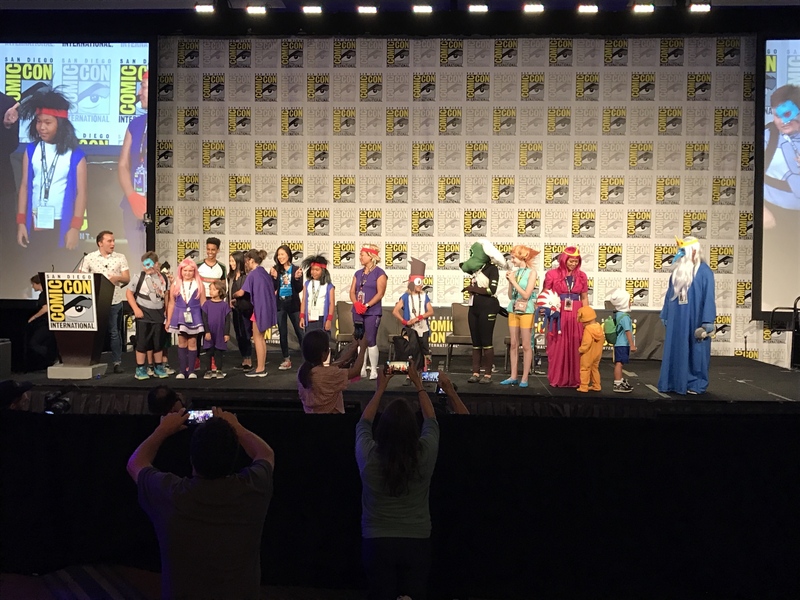 Every year, Cartoon Network hosts what the call the Costume Ball for fans to dress up their favorite characters from CN shows. Last year, I debuted KO, and I felt I should bring him back, better than ever. 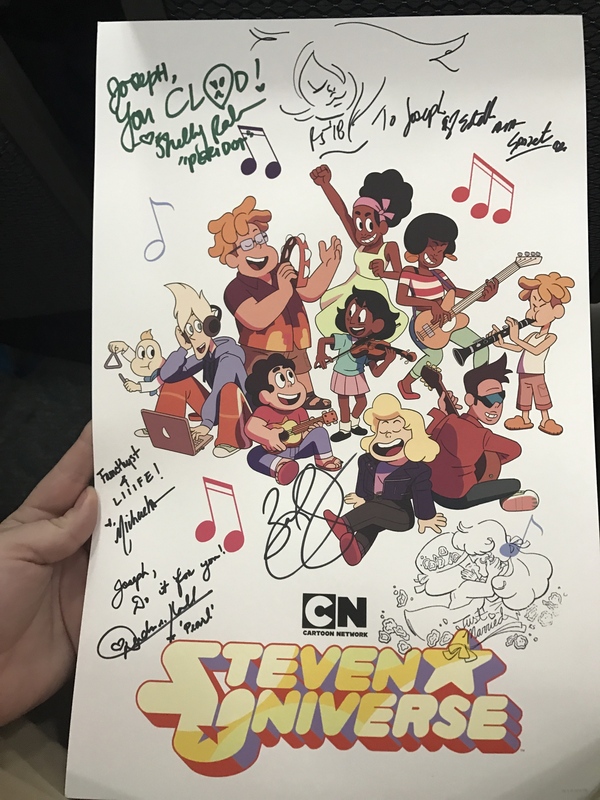 Sam brought up Philip Solomon (voice of Craig from Craig Of The Creek), Michaela Dietz (voice of Amethyst), and Deedee Magno Hall (voice of Pearl) to help him out! There were tons of great cosplays, and the winners certainly deserved to win! 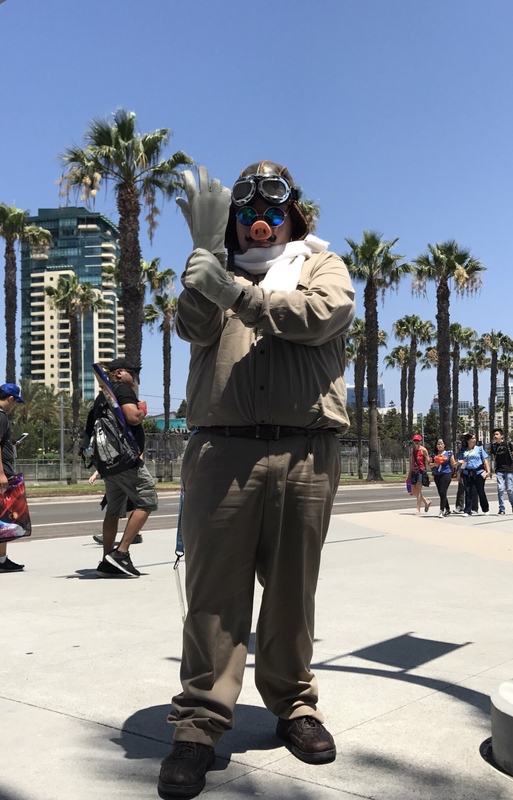 If you want to check out some of the other great cosplays during the costume ball, check out the photos from the entire weekend of San Diego Comic-Con! And with the weekend drawing to a close, I took account of everything I got at the con. 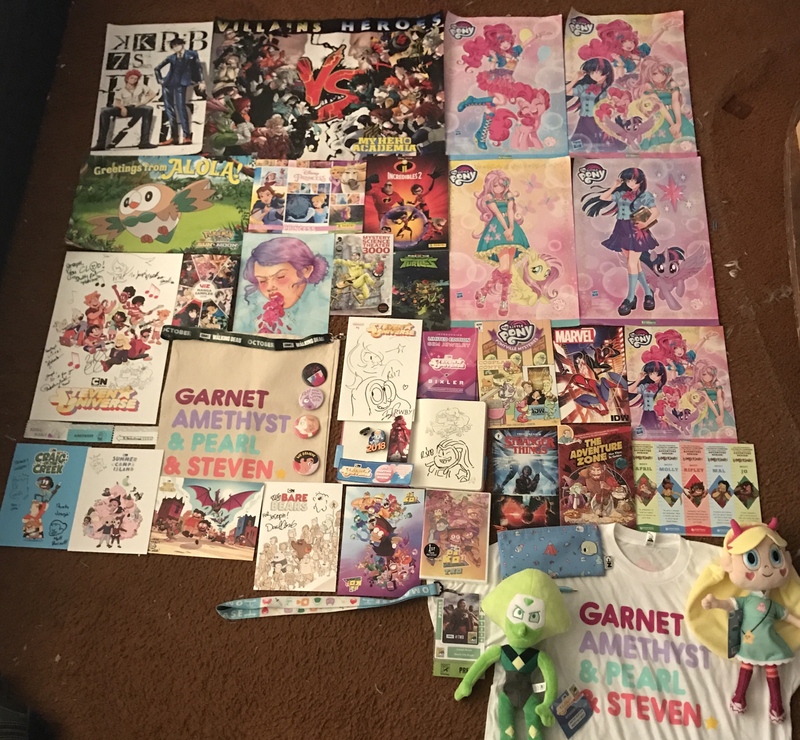 It was a pretty good haul of convention stuff! 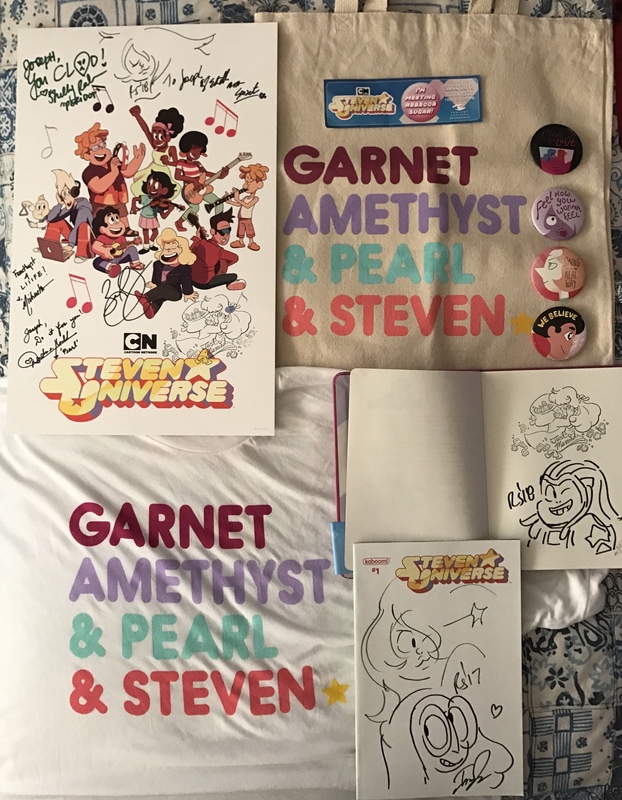 Of course, I'm sure you all want to see the Steven-y stuff that I found at the con! 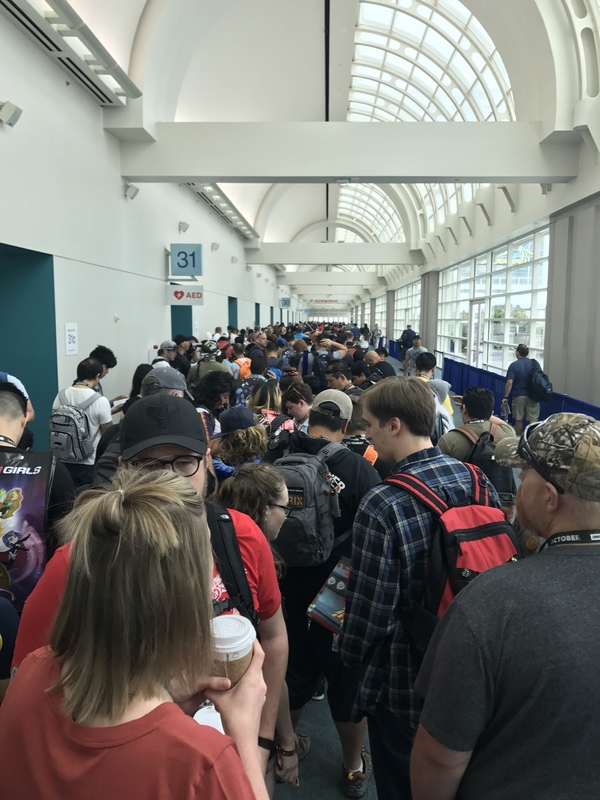 Well, that will do it for my recap fro San Diego Comic-Con 2018! 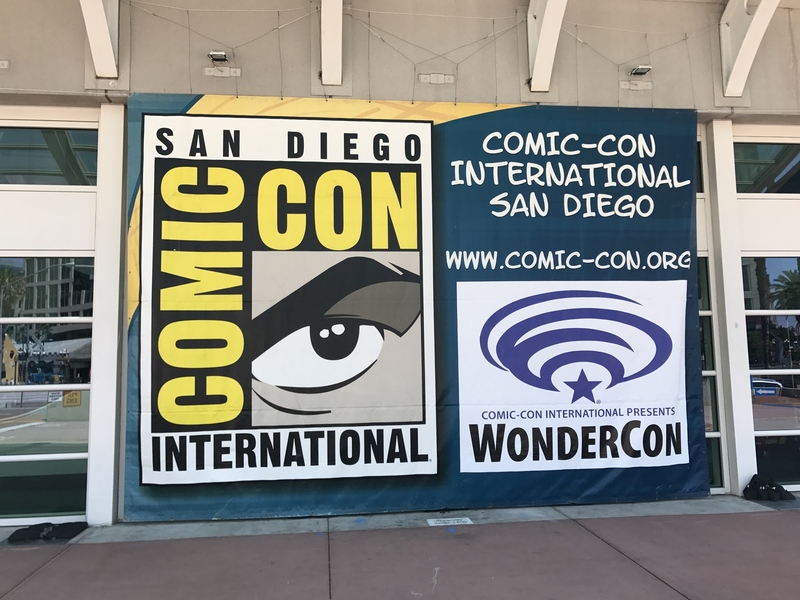 Join me for the next convention recap, whenever that might be!